Throughout 2012, S+H will go beyond the annual Top 10 by presenting violations 11-30. 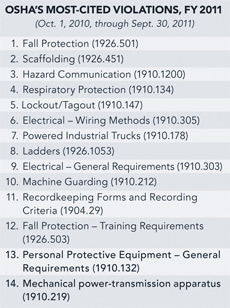 The data*, supplied by OSHA, represents violations cited during FY 2011 (Oct. 1, 2010 – Sept. 30, 2011). Requires reliable and sanitary personal protective equipment to be provided and used when necessary to protect the body from environmental, chemical, radiological or mechanical hazards. Covers the general requirements for most types and shapes of power-transmission belts, including the principal features with which safeguards shall comply.